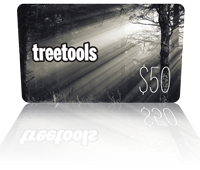 Treetools offers students, studying arboriculture, at MIT, Wintec and Otago Polytechnic the opportunity to purchase course-related equipment at below our standard trade prices, through our 'students only' section on the Treetools website. Students need to ask their tutor for access details. Once registered you have access to a catalogue of course-related equipment developed over the last ten years in consultation with NZ educational institutes. Not all of Treetools climbing, rigging, safety and pruning equipment is available at 'student' pricing. You need to be registered and logged in to access the 'students only' catalogue. You will find the students log in located in the top menu bar, the second icon from the left (the graduation cap). Once you are in the student's section, you'll notice a new menu at the top of the page. Click on any of these tabs to locate the relevant student priced equipment. Products in the 'students only' catalogue have a name followed by (*S). The *S denotes product exclusively priced for Student Members only. Product without the *S in the title is at standard trade pricing so be careful when you load your shopping cart. Please note: the search feature on the main Treetools website does not include *S titled product. All products with the *S in the title qualify for free shipping. To get the most out of this feature, you are best to purchase all your *S titled products in one session. If you mix trade priced products (i.e. not *S products), you will be asked to pay for shipping on orders, under a total value of $250, at checkout.